After a couple of decades dimly perceived media limelight, the Russian wolf has suddenly loomed large in the headlines in a way that it has not since the bad old days of the Cold War. After the fall of both the Soviet Union and the Berlin Wall, a collective amnesia among western countries—especially in America and its UK deputy sheriff where global politics is habitually defined in terms of white and black hats—that the wolf wearing a new capitalist waistcoat and riding a spiffy new non-Lada-made bicycle was fit to invite to tea. This impression was reinforced by western media having unprecedented access across the country, newly rich Russian oligarchs buying up half Chelsea and Baltic cruise ships calling at renamed St Petersburg to witness the cultural magnificence of the Hermitage. Despite the fact that not one in a thousand Brits understand the Cyrillic alphabet, let alone speak Russian, the inclusion of Russia in the G8 signaled the bear was tame and all was well. Granted, to those of us grown up under the shadow of WW3, it is a relief not to care where the next fallout shelter is and how many loved ones you might reach if given the five-minutes-to-Armageddon warning. That philosophy was simplistic and bleak. What we have now is simplistic and dangerous. Back then, the rarity of insight ‘over the hill’ was underscored by Sting’s “If the Russians Love their Children too” being one of the few messages of hope in a desolate flurry of Fleming/Le Carre eyeball-to-eyeball cultural icons. And, just as it was simplistic then to malign the Russians as the Cold War baddies, so was it even more so to imagine that 200m people were suddenly going to embrace western identity wholesale. The present series of Mexican standoffs along the Ukraine/Russia border is entirely understandable to those who have made a study of the history, culture and mentality of a people who have much to offer the world besides nuclear annihilation. Russia, like most countries, was born in turmoil. But most western countries didn’t have brutal raiders like Vikings, Mongols and Turks invading them from all sides over centuries. And just as a long-overdue unification of Germany led to it feeling its oats and to a couple of world wars before it calmed down, so the great unification and expansion of Russia under Peter the Great led to wars and iconic victories at Poltava and Borodino that shaped the Russian mind that the Western neighbours were enemies and invaders, not friends. Pilsudski’s Poles in 1921 and Hitler’s Germans in 1941 did little to dissuade them. So, despite international achievement from Tcaikhovsky through the Bolshoi to Faberge, Russian paranoia on this account found its deepest expression in Stalin, who used WW2 to build the biggest buffer zone Russia ever achieved on the back of the greatest victory ever achieved unflinching from 28 million sacrifices (27% of the population, compared to UK’s 0.94%). What the Russian people went through 1941-45 was unimaginable to our cosy Western lifestyle. The Wehrmacht surrounded Leningrad and, through two bitter Baltic winters, tried to starve out the 3m inhabitants. Over 1m died—of cold, disease, malnutrition more than bombs or shells. But the trams ran; the factories turned out munitions; the workers ate bread that was mainly sawdust. Inured by a hard 19th © lifestyle that makes our Highlanders’ sparse pre-Culloden life seem luxurious by comparison, by WW2 they had built a modern country in the teeth of Western opposition. They pride in the Bratsk power station or the Dniepr dam and the fact that they out-designed, out-produced and out-fought the much-vaunted Wehrmacht while the Allies were taking three years to chase an Italo-German sideshow out of North Africa. No matter what country you come from in Western Europe, you are ill-equipped to project yourself into the Russian psyche. It is 40 times the size of Spain; Moscow is regularly above 25degC in summer and below -10degC in winter; the train from Moscow takes 6 days to reach Vladivostok; Russia’s forests cover 7.7m sq km—14 times the size of Spain. Russians are more dour and inexpressive than the Scots but, like the Scots, once they warm to you are embarrassingly generous and make solid friendships. They love music and dancing but are especially passionate about poetry, most being able to recite Pushkin or Soviet-era writers like Yevtushenko. Even today, they are stoic, phlegmatic in surviving on little, proud rather than ambitious yet curious as children about the world. Survival of individuals has always been a crap shoot. Mother Russia has survived every invasion even if whole swathes of the people didn’t. As a result, their whole history revolves around a strong leader holding their vast country together—even if it’s by means that squeamish Westerners would disown. Among family and friends they are very human, but geared to accept strictures that life and or the government imposes. They expect strict and clear principles on what is or is not acceptable—in many ways the emotional reverse of the American ‘land of the free’ ideal. This alone goes far to explain why they so often misunderstand one another. It also helps explain the rise of the Russian oligarch since Glasnost—those who apply bald capitalism can exploit their own people’s relative passivity quite easily. Since the fall of Communism in Russia, there has been too swift a readiness to see Russia as an extension of the West. It has released its satellites, pulled its troops back home, joined in economic summits, joined in world trade and exported billionaires as well as raw materials and wheat. But it is no more relaxed about sovereignty and prestige than France is about the inviolability of the French language. Losing its military buffer states against a repeat of 1941 was traumatic enough. It wore sheep’s clothing as a pragmatic way to feed its people and trade its way back into the world. But when the Ukraine starts talking with the West, alarm bells ring in Russia; traditional loyalties seem turned on their head. Why Krushchev decided to award the Crimea to Ukraine is a mystery. Russia had fought the Turks over it for over a century—that’s where our Crimean War came from. And, now that Russia is come down in the world from superpower status, that their principal arm protecting their southern borders—the Black Sea Fleet—was suddenly based in a foreign country was too much to swallow long-term. Though the Ukrainians may protest (partly because the West naively encouraged them to) over ‘loss’ of Crimea, the Ukraine was never a state before now and therefore has scant right ‘historic’ to provinces. This is not to condone Russian actions but they are a very practical lot; if they want something and think they have the power to grab it, they will, or expect to be considered weak. The most sensible suggestion about the whole crisis came from Kissinger, who argued that, rather than being tugged hither and yon by both the EU/US and its Russian opponent to join one side or the other, Ukraine could make the best contribution as a bridge. (see earlier blog Kissinger on Ukraine), something the Russians might tolerate. Membership of NATO or EU is not. The Donets industrial basin in Eastern Ukraine is less clear-cut but, populated as it is largely by ethnic Russians and included in the country thanks to some questionable boundary-drawing by Stalin’s Kremlin, there is a genuine problem about Russian minorities who, in that particular case, aren’t a minority. Given that Putin’s standing within Russia (a matter far more important to him than international niceties) it is not rocket science to predict that a relatively easy victory snatching Crimea makes it tempting to try for Donets too. Because what can the West do? The Russians have overwhelming military superiority in the area. Even America at its most gung-ho would not stick its hand into this wasps nest because the Russians could obliterate anything they could deploy that far from home right on Russia’s doorstep. This is why the US let Russia have its way in Chechnya, Georgia and other tinder-box flare-ups along its southern border. The best the West can bring is a non-player here. So, when Alex Salmond, while qualifying any admiration, declares that Putin’s actions have been a good thing insofar as it has restored Russian pride, he is demonstrating a firm grasp of realpolitik that seems to have eluded most English party leaders. Instead of making the best of a bad job like Alex, the UK government and its opposition have struck a pose both unrealistic and pathetic. They seem to think they command a deployable force that the Russians won’t fall over laughing at. 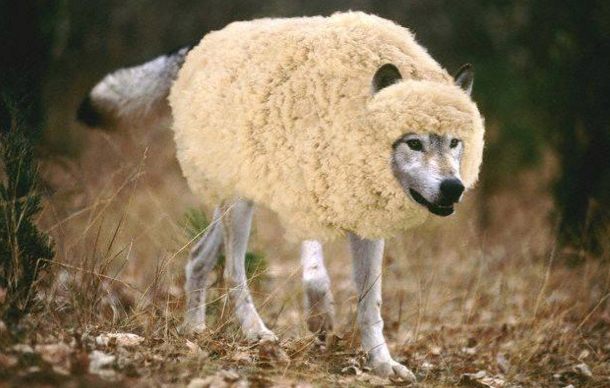 Just because the Russians have recently donned sheep’s clothing internationally to avoid frightening trade delegations away, doesn’t mean they don’t still have sharp teeth and remain brutal as ever about using them. In Putin, Russia has a leader they like, not least because he understands them. Resisting their ambitions has long been a part of the global ‘Great Game’ that imperial Britain once played on the North-West Frontier. But, while Russia may not be what it once was, Britain is a weak shadow of its 19th © self and should stop sabre-rattling before someone gets hurt. This entry was posted in Politics and tagged Russia; Ukraine crisis; realpolitik. Bookmark the permalink.